 Log In needed $119 · Acer Recertified 21.5" LCD Computer Monitor w/ 1 Year Warranty! 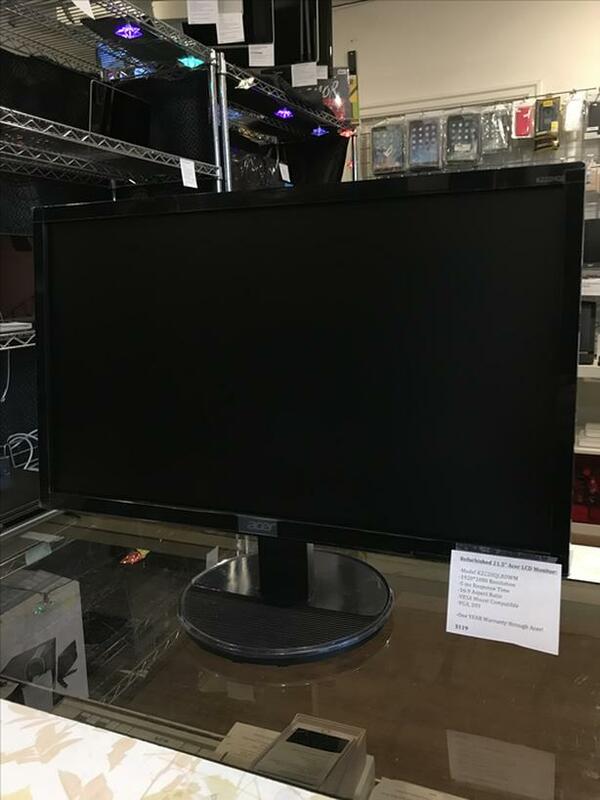 We have an Acer recertified LED 21.5" LCD Monitor! This comes with a one year warranty through Acer! This specific monitor comes with a ONE YEAR warranty through Acer! We take trade-ins as well! EB Computers specializes in selling refurbished and off-lease Windows and Macintosh Laptops and Desktops, as well as Apple iPhones and Android Cellphones. All of our computers go through a 20 point testing process before we put them up for sale, and any damaged parts are fixed. We then put a fresh operating system on them, and include free Anti-virus (PC), and Office programs (PC and Mac). PC's will all come with a legitimate OS key, and Macs will generally be updated to the newest system that they can run. All of our phones go through an 18 point testing process before we put them up for sale. Additionally, iPhones are removed from iCloud, and all phones are reset to factory settings and are generally checked for blacklisting. After all of this, we then put a 90-day Hardware Warranty on all used items, which generally covers the same things that a manufacturer's warranty would. All of our inventory comes with a 90-day warranty!